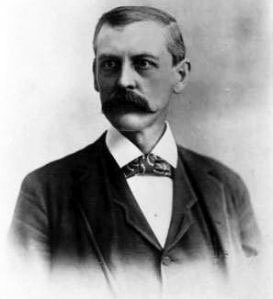 In the end of 1880s Willard Legrand Bundy (1845-1907), an owner of jewelry store in Auburn, New York, (see biography of Willard Legrand Bundy), devised the first electric-cash register in the world. The device was patented in 1890 (US patent Nr. 443475). Willard Bundy was a businessman and inventor, who obtained patents of many mechanical devices, but was mainly known for the invention in 1888 of a mechanical time clock, an early version of the time recorder (a mechanical device which recorded when workers clocked in and out of work), which was manufactured in a company of Bundy brothers (Willard had a younger brother—Harlow E. Bundy). Let's examine the electric (battery powered) cash register of Bundy, using the patent drawing (see the lower image). 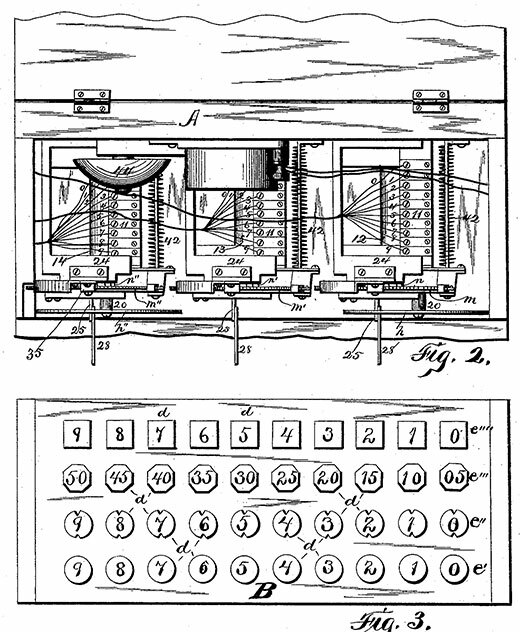 The object of the invention was to provide electrically actuated cash drawers or registers designed for use in stores by cashiers, combining with it an adding machine to add the amounts each and every time a button or buttons are pressed to make up the sum placed in the drawer, at the same time to indicate and display the amount of each purchase on one or more dials, one dial indicating units, another tens, a third hundreds or dollar-units, and so on. Also to provide means by which two or more dials can be operated to indicate a large amount by actuating two or more buttons in succession; to release the drawer by the making of a circuit; to automatically throw the drawer open; to provide means to prevent the reopening of the drawer after being fully closed or to prevent its being reopened after being partly closed without the drawer is first fully closed and then reopened by the pressure upon a button; to provide a double-figure button operating to open the drawer by making a double contact successively and simultaneously operating the disk of units and the disk of tens; to provide means for registering each and every time the front of the case is opened, whereby access is obtained to the registering-dials; to ascertain the total amount taken in; to provide means by which the amount of each purchase is displayed upon the back of the apparatus to show the customer the registry when the back is toward him, and to actuate all of the several mechanisms by the electrical contact of any of the single or double buttons. Willard Bundy (and the companies, associated with him) was also a holder of quite a few other patents in the area of cash registers and calculating machines. 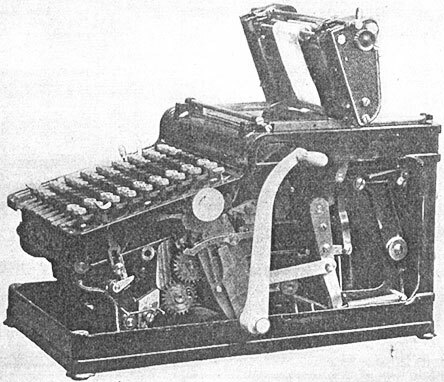 In 1891 he obtained a patent for card-printing attachment for cash registers (US patent 457766). He was also a holder of following US patents: Nr. 1113099 and Nr. 1117200 for calculating machines; Nr. US617560 for Type Writing and Adding Machine. They had also patents in Austria (AT19424B and AT27631B), Germany (DE194212 and DE197451), France (FR331823 and FR360783), and Great Britain (GB190300409 and GB190516651). Bundy Adding Machine (see the upper image) was advertised in 1904-1906 (see the article in The Binghamton Press from September, 1904) and was put in production by Bundy Mfg. Co. of Binghamton, NY, managed by Harlow E. Bundy.